Can you crunch away menstrual cramps? Home > energy > Can you crunch away menstrual cramps? 19 Nov Can you crunch away menstrual cramps? You don’t hear a lot about wheat germ nowadays. The once go-to health food trend has been replaced by other health food fads, like juicing, quinoa, coconut oil and kale burgers. Turns out, wheat germ could help ease menstrual cramp pain. That’s the word from a new triple-blinded study of 80 women suffering from menstrual cramps that found those who took 400 mg. of wheat germ extract three times daily from Day 16 to Day 5 of their cycle (which is roughly most of Week 3, all of Week 4 and most of Week 1) for two cycles in a row experienced a significant decrease in period-related discomfort–and used far fewer pain relieving medicines while taking the wheat germ. What gives wheat germ the power to banish period pain? The researchers say it come down to its rich supply of a wide array of vitamins and minerals that have been shown to help reduce inflammation, relax uterine muscles and curb the production of cramp-triggering prostaglandins, including magnesium, calcium, vitamin E and vitamin B6. Bonus: Previous research shows that the same cramp-busting nutrients in wheat germ also decrease headaches, fatigue and anxiety–common premenstrual problems. I prefer my wheat germ crunchy. But, you prefer it in a pill or want to be sure you’re getting the exact amount used in the study–400 mg. three times daily from Day 16 to Day 5–you can find wheat germ extract at health food stores and online. 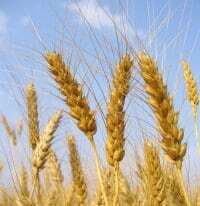 Have a wheat allergy or are avoiding wheat for other reasons? Not a problem! Take a look at the many other study-proven cramp-busters and PMS-nixers I’ve reported on to find one or more that work for you.